I have recently received quite a few enquiries on Happy Saints cupcake toppers, probably because many people have seen them on the highly recommended Catholic Icing website, and a few other places. I do not provide templates for cupcakes toppers. I do have downloadable ebooks available that feature 2.5inch badges of saints that you may print out and make your own toppers, or any other paper crafts. View the entire ebook catalog. If you are planning to make your own paper crafts e.g. cupcake toppers, bingo game etc., you can check out my instructional on how to extract images from the ebooks. Some have also asked where they can download free Happy Saints images. I do post previews of saints on my website and you may use these preview images for your personal and non-commercial use. However, the images are watermarked and are low resolution… and I do not archive what I post. A complete collection of high-quality, watermark-free Happy Saints badges is only available in the ebook collection. 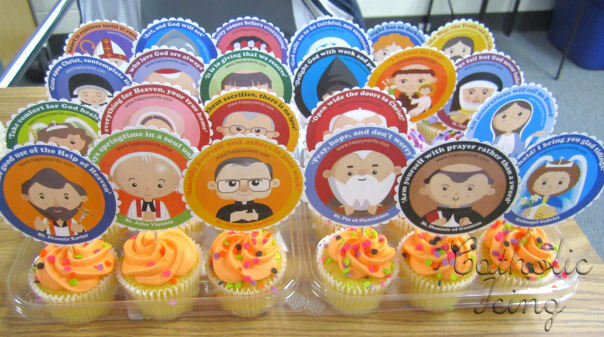 Would you consider selling an "ebook" of cupcake topper images only?? ?